The Contact Form 7 plugin is the easiest way to create a simple contact form for your site. 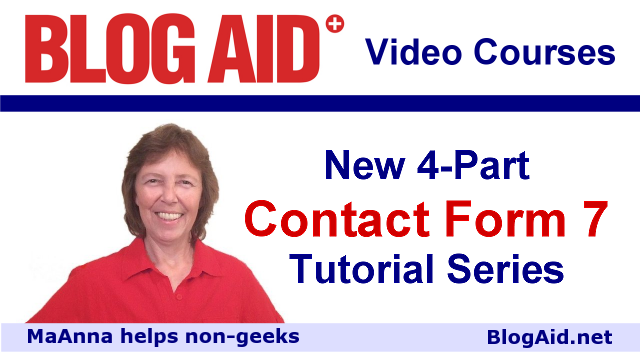 This new tutorial series is for non-geeks and takes you from start to finish. Learn how to customize the text above each field so the form is more inviting to visitors. You’ll also see how to make fields required. And, you’ll discover the two built-in ways to protect your form from bad spam bots. Learn how to customize all the elements in the Mail tab for proper form validation. In early 2016, Contact Form 7 added a validation tester to help with emailing the form results. Even users having no trouble with their form could not get it to pass the validation test. Part 2 of this series shows how every field in the Mail tab should be completed to work well and pass the validation test. Plus, you’ll learn how to customize the result messages, including where the email originated. That is especially helpful if you use this plugin on multiple sites. Learn how to create a Thank You page redirect after form submission, plus tips about what to have on that page to increase time on site and make for a more enjoyable visitor experience. Plus, learn which submission messages you definitely want to customize, especially for submission errors. Learn advanced form options, including the addition of more form fields like radio buttons and checkboxes. You’ll also see how to add the results to the email the form sends you. And, get tips on all the types of elements you can add to the form, including one that may present a security issue. Click here to see a full list of all the tutorials in the Site Success Courses Libraries. Get your learn on and go at your own pace through WordPress Starter, Basic, and Advance levels.